A Brisbane-based writer who enjoys discovering good food experiences, great coffee and fun events. Subscribe and we will keep you posted on what's happening in your city. A few weeks ago, on my way to West End I drove by a quaint sky blue and white café with the most delicious name, Gertrude and Mabel. My brain is obsessed with playing word association on loop so I had the vision of two adorably proper grandmas sipping tea with fine china. In my mind Gertrude and Mabel are best friends who like to wear Mother Hubbard muumuu dresses and straw hats. Oh and they never dare to venture outdoors without their string of pearls. Old ladies and fine china usually leads to the promise of cake. Where there is tea and cake …typically there is good feed. So you see, this café had me at Gertrude and Mabel. On Sunday morning I wore my pearl earrings and drove to Dutton Park with a few friends to spend the morning at Gertrude and Mabel. My friends and I enjoyed a coffee outside while we waited for a table. The waitress skilfully brought out our topped-to-the-brim Two Seasons Coffees with a small bowl of sugar cubes. Sugar cubes that forced me to decide right there and then what kind of person I was…white sugar or brown? Bad or not so bad? 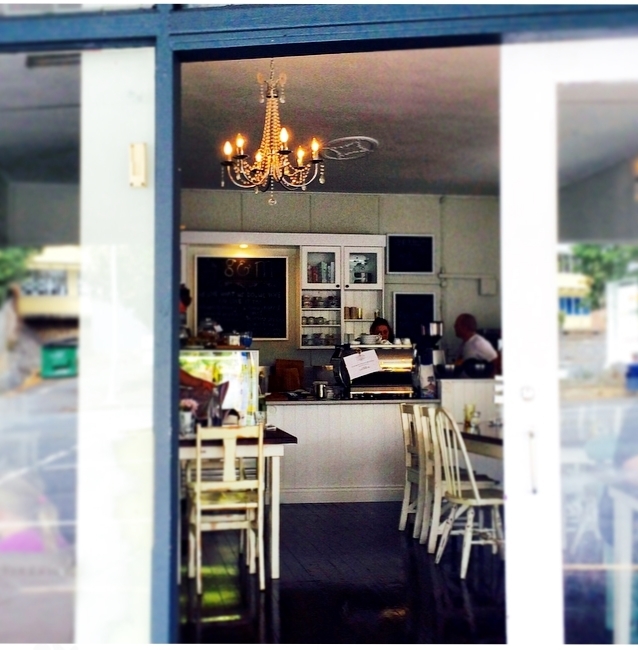 Inside the café is a sun filled white wash shabby chic space. Fine china, chandeliers mixed with sweet garden flowers, glass jars and pretty cloth napkins. I can see myself on a few solo missions with a good book in search of coffee in the very near future. The menu is small but quite adequate, something for everyone. My breakfast consisted of eight minute egg and ocean trout served with avocado, tomato, mozzarella on black bread. It was served on a small wooden board. I enjoyed it, great flavour combination and serving size. Avocado, Cherry tomato, Buffalo mozzarella, basil, olive oil, black bread with 8 minute eggs and House-cured ocean trout. My friend had a side of bacon with her avocado, tomato and mozzarella on black bread. The gents ordered the largest thing they could find on the menu which was the breakfast board. It looked fantastic but unfortunately on the day they were all out of loukaniko (pork sausage). My other friend only had eyes for the pancakes on the menu. It was actually just one rather large crumbly blueberry and chocolate pancake that she didn't get through. Blueberry and dark chocolate single pancake, mascapone and an assortment of fruit and nuts. The staff was on point and friendly. You can see they are nice people as it shines through their service. There is a selection of cakes, biscuits and pastries all made from scratch, its the real beauty of a large food loving family. Their produce is a combination of home grown and locally sourced from other small businesses. They have chosen Barambah organic milk and dairy, as Nathan grew up in that region. Danielle explained that they also offer catering for small to medium events. You can hold a private event in the café or there is also a pick up option for offsite gatherings. Keep them in mind for High teas for Bridal or Baby showers. They offer custom designed menus based on individual requirements and budgets. I bet you are still wondering about the origin story of Gertrude and Mabel... Well (shockingly) the truth does not involve muumuu dresses or best friends or any sort of pearls. Gertrude and Mabel is named after two streets in Highgate Hill where Danielle's grandparents live. The café name is a tribute to where Danielle and her brother grew up. Gertrude and Mabel, thank you for breakfast and its lovely to make your acquaintance. When: 7am - 4pm Tuesday to Friday & 8am - 2pm Saturday and Sunday. Hope they've crockery, as I will NOT eat off wooden 'plates', for hygiene reasons. Will phone ahead to check. I lived two blocks back from there, as a child, so know area extremely well. Still attend Highgate Hill Dental Surgery! Entertaining story, thanks Claudia. The serviettes and cutlery have lots of old world charm.